A mainly sunny sky. High 79F. Winds SSW at 5 to 10 mph.. The Stronghold Climbing Gym in Lincoln Heights has a limited number of spots available for the final three weeks of Summer Climbing Camp! for the week of July 30 – August 3, August 6 – 10, or August 13 – 17. Summer Climbing Camp is a great way for young climbers to explore bouldering and roped climbing, learn new skills like rappelling, and practice yoga and slacklining. Activities include tie-dying, team-work challenges, climbing games, and learning to tie essential climbing knots. 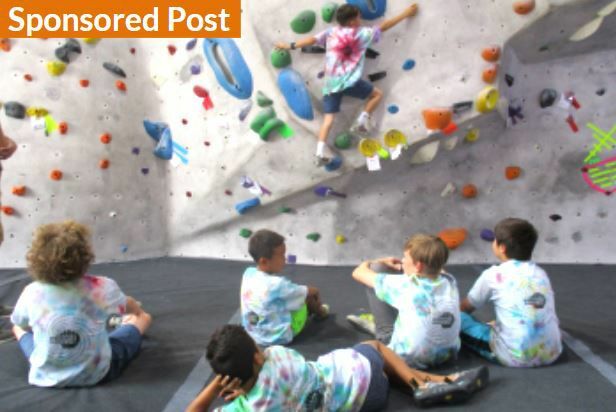 Summer Climbing Camp is designed for kids ages 6-14. Both new climbers and campers with a lot of climbing experience are welcome. All campers leave camp with new knowledge, skills, and climbing friends. Interested in other options for young climbers? The Stronghold runs a Kids’ Climb program Saturdays and Sundays, from 2 PM – 4 PM. More information and registration is here. 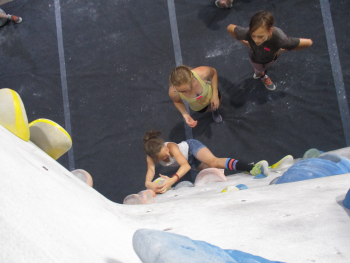 For dedicated young climbers, the gym also runs recreational and advanced youth climbing teams that challenge participants to develop toward their own climbing goals in a supportive team environment. Members of the advanced team participate in USA Climbing competitions at the local, regional, and national level. If you become interested in getting more involved in climbing, the gym offers a wide range of classes. The Intro I class or the Intro to Climbing Package are great places to start.